How do you discover and nurture young mathematical talent in a way that crosses geographic and socio-economic boundaries? Brazil, host of the International Congress of Mathematicians 2018 (ICM), seems to have found an answer: cast you net wide and inspire young students with problems that don't require previous mathematical knowledge. Students celebrating at the OBMEP award ceremony. 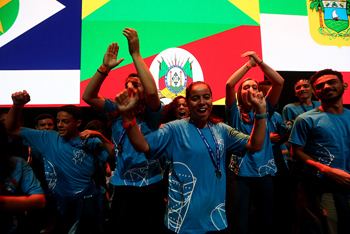 The Brazilian Mathematics Olympiad of Public Schools (OBMEP) was launched in 2005 to address Brazil's below average performance in the Programme for International Student Assessment (PISA). The aim is three-fold: to discover talented students, to train them, and to stimulate them to study maths at university and improve maths teaching in Brazil. All students that go to state schools are automatically enrolled in the first stage of the Olympiad and take an exam consisting of questions that don't require them to have lots of previous mathematical training. The top 5% of each school go on to a second stage, and the final winners are rewarded by gold, silver and bronze medals as well as honorary mentions. The reach of OBMEP is incredible. In 2017 nearly 18 million students took part in the first stage and 1 million went on to the second stage. At the end a total of 500 gold medals, 1,500 silver medals and 4,500 bronze medals were awarded and there were 46,000 honorary mentions. Mathematician Artur Avila, who won a Fields medal in 2014, thinks that shifting the burden away from individual teachers is a major advantage of the programme. "Brazil is a huge country and we don't have enough teachers with the capabilities [to discover and support talented students]," he says. "[OBMEP] reaches [remote] places of the country, so students can be discovered in this way and you can give them some support. It's a short cut — it's not a solution to all educational problems, but it's very effective." Nearly 500 current OBMEP students travelled to the ICM in Rio last week, where they were awarded their medals and also had the chance to meet Avila, as well as Fields medallist Alessio Figalli. "I found this event absolutely fantastic," Figalli told us. "The maths olympiad is an excellent way to challenge young students with non-standard maths problems that require creativity, and I really appreciate what Brazil is doing towards supporting the olympiad." Plenty of individual success stories have arisen from OBMEP. An article by OBMEP Coordinator Claudio Landim in the ICM 2018 magazine quotes the story of Gérson Tavares, a student who worked during the day and studied in the evenings, and who had never displayed any interest or particular talent in maths. Yet Gérson made it through to the second stage and went on to receive a gold medal. After that he continued to study on his own, won three more gold medals, and eventually graduated in Electrical Engineering at the prestigious University of São Paulo. The organisers believe that these individual successes translate to higher attainment in maths at the level of schools, regions and the entire country. Francisco Soares, who conducted a study into OBMEP said in the above mentioned article, "The results found show a very significant impact of a school's involvement with the OBMEP on its student grade in mathematics. This impact is greater as the time of the school's involvement with the Olympiad increases, indicating the importance of the school's ongoing involvement with this initiative." The PISA study found a significant increase of 21 points in the average of students between 2003 and 2015. Teachers stand to benefit too: those who pass a national exam held in context with the Olympiad receive a grant to attend training sessions on how to prepare students and set up training sessions in their school. This year's OBMEP winners certainly enjoyed themselves at the ICM in Rio de Janeiro last week. Apart from Avila and Figalli, Fields medallist Cédric Villani also attended the award ceremony at which the students were given their medals. "I was really moved by seeing so many students from all around Brazil coming to the ICM to receive the award," says Figalli. "Having a chance to meet them was a very rewarding experience, I hope that many of them will succeed in becoming professional mathematicians." A very good initiative to promote Mathematics! This is a great effort in order to promote the knowledge of Mathematics among students and sync them with learning the concepts on the topics of Maths so that they could become future mentors and teach effectively to the future generations. Thanks for sharing the idea with us, all the best to the team for their efforts. Keep on sharing the insights with the latest updates.